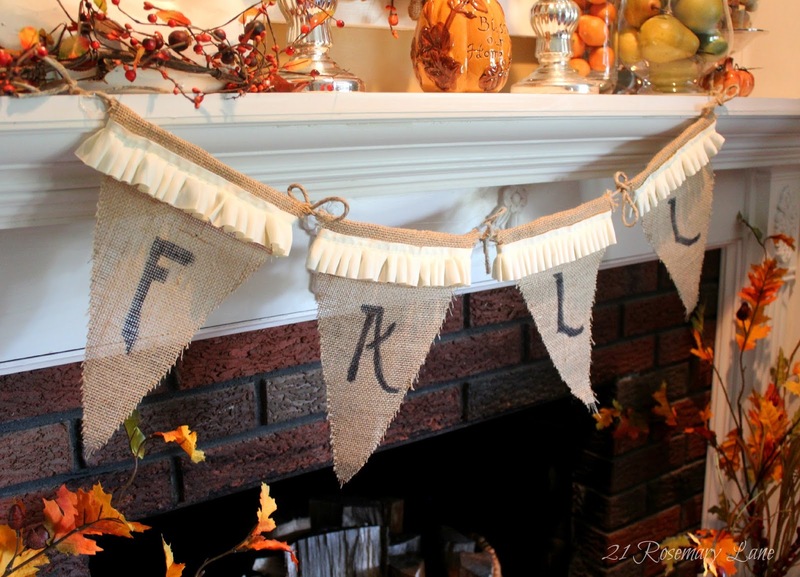 This is a super easy project and looks so cute! 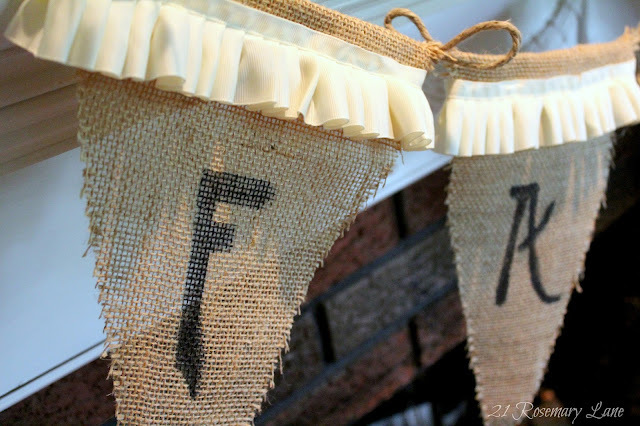 All you need is some burlap, jute twine, black marker, a pair of scissors, hot glue and a little trim. Oh yeah and some card stock to make your template. I found all of my materials with the exception of the trim, at my local Walmart. Create your template by measuring out the size of your triangle. I made mine 12 inches and added a little extra at the top so to fold the burlap over the jute twine. Once I cut my flags I ironed them to remove any of the creases which occurred while the fabric was folded. Next I glued the top of the flags to the twine. I did this by laying the twine about 1/4 of an inch down from top of the flag and put a line of hot glue onto the twine. Then the burlap was rolled over the twine so that there were no frayed edges. In between each flag I tied a little bow in the twine and then secured it with a dollop of glue. Once all the flags were on place I turned the whole thing over and glued the trim to the front about 1/2 inch down from the top of each flag. (Right below where you can feel the line of twine.) The trim was wrapped around the back to give it a finished look. I extended it about a 1/4 -1/2 inch on each side around the back. Finally I free handed the letters on with plain old black marker. You can always use a stencil if you one handy that will work. And ta-da...you're all done! I think the new banner totally rounds out my fall mantel display. Hope you are having a super day and wishing you a wonderful weekend!!! Very cute....now if the weather would get nice and crisp! We are the same wave link today. 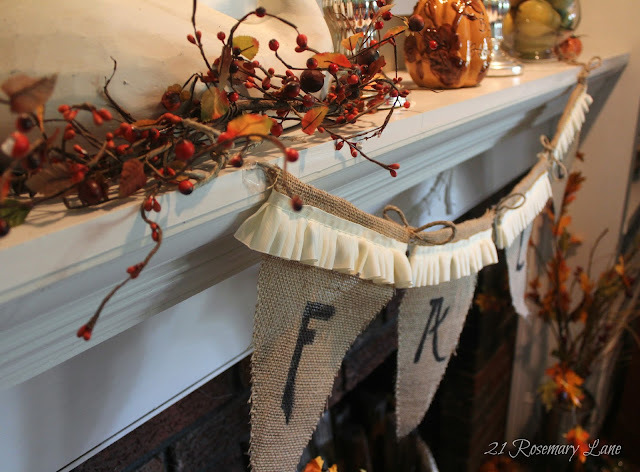 Your burlap bunting is so pretty and it looks so good on the mantel. 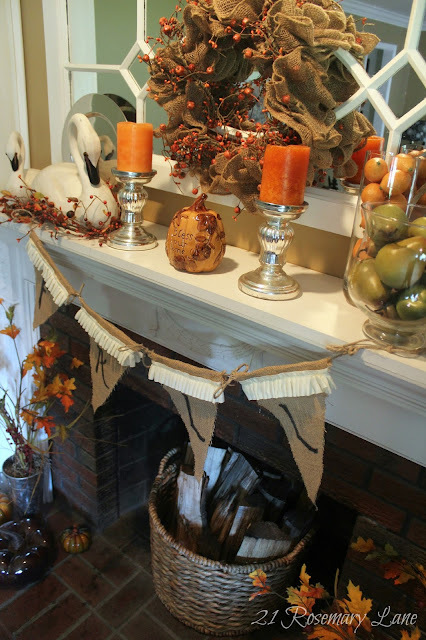 Aren't burlap wreaths the best ever!! 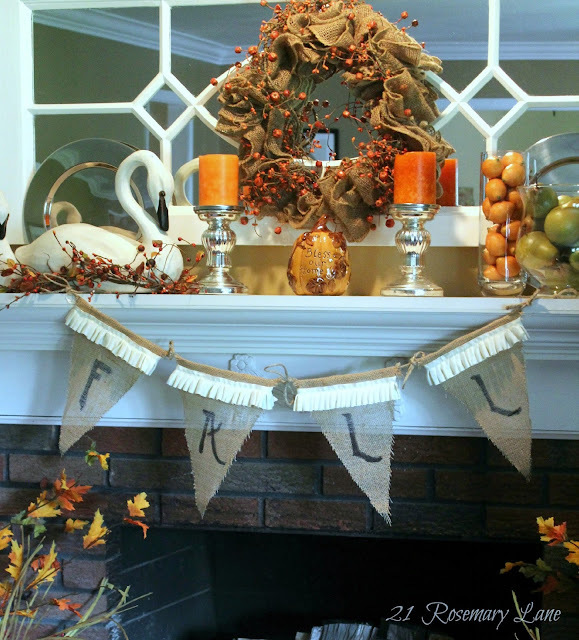 You did a great job accessorizing the mantel colors. 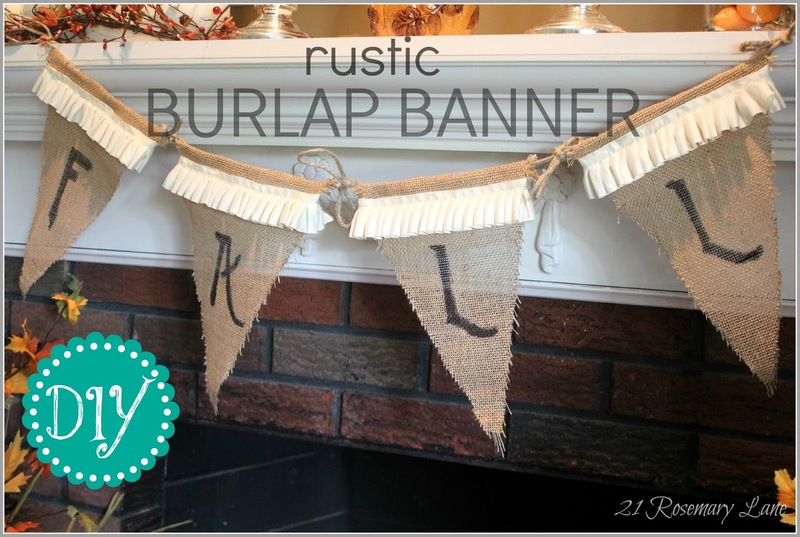 Come see my burlap bunting. I love the contrast of the texture of the burlap against the white mantle and brickwork. Such a nice layered effect. 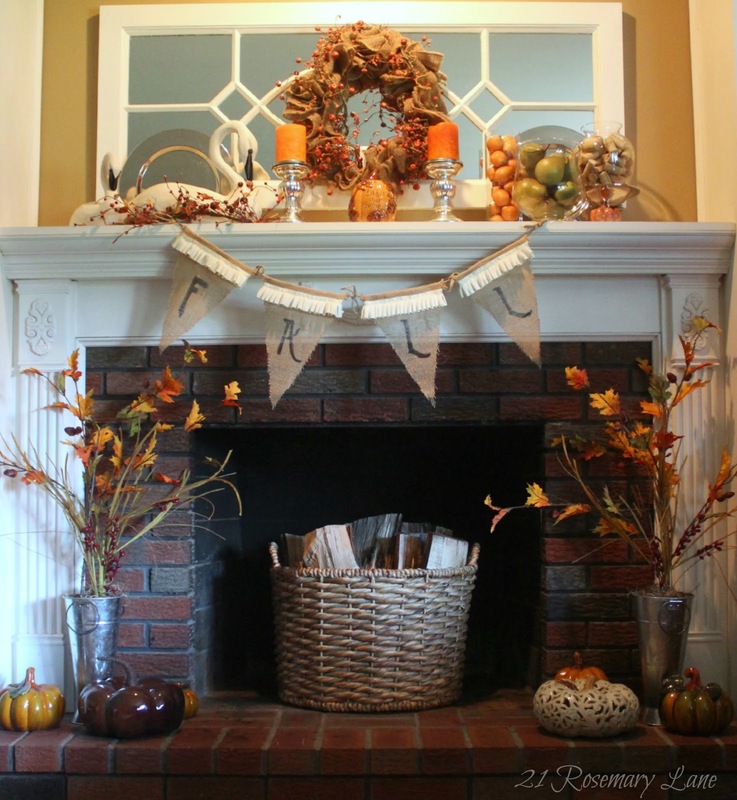 Your fireplace is so warm and inviting, I can see curling up and reading a book there as the weather gets colder. Thanks for the great ideas.